At least 18 people have been killed in Indonesia following a spate of suicide bombings which targeted three churches and government buildings. The Islamic State claimed responsibility, crediting the attack to a family of bombers, which includes children. On Sunday, a husband, a wife, and four children, including a 9-year-old girl, carried out the attacks against churchgoers at Santa Maria Catholic Church, Diponegoro Indonesian Christian Church, and Surabaya Central Pentecost Church. The father reportedly exploded a car bomb, while the mother and her two daughters, aged 9 and 12, and two sons, 18 and 16, use a motorbike to carry out the other church attacks. 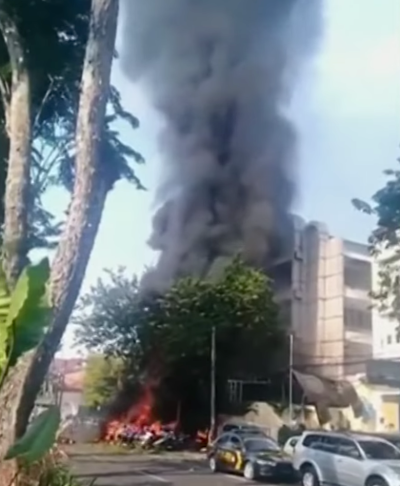 "The husband drove the car, an Avanza, that contained explosives and rammed it into the gate in front of that church," confirmed police spokesman Frans Barung Mangera, according to Sky News. Following the weekend church bombings, a family of five, including three children, launched a new suicide bombing Monday morning at the police headquarters in East Java's provincial capital Surabaya, as reported by UCANews.com. While so far at least one fatality has been confirmed by police in the latest attack, initial reports say that seven people were killed on Monday, including four of the attackers. Christian leaders have responded to the deadly wave of attacks on believers by calling for peace, and by praising the actions of those who sacrificed their lives to save others. Father Alexius Kurdo Irianto, the priest at Santa Maria Catholic Church, said that a churchgoer by the name of Aloysius Bayu Rendra Wardhana died while attempting to prevent the bombers from entering the church compound. "If he had not stopped the bombers, there would have been more victims [inside the church]," Irianto said. The victim's mother, Rosalia Siswaty, said that her family was "proud to have a martyr who gave his life to save hundreds of people attending Sunday Mass inside the church building." "He had completed his service in this world. He was called to serve the Lord in Heaven," she stated. The Islamic State (also known as ISIS), which for years has been spreading its influence in the world's largest Islamic nation, claimed responsibility for the attacks. The terrorists also said they orchestrated another hostage-taking ordeal last week, where imprisoned IS militants at a detention center near Jakarta killed six officers. "This act is barbaric and beyond the limits of humanity, causing victims among members of society, the police and even innocent children." Father Agustinus Ulahayanan, executive secretary of the bishops' Commission for Ecumenical and Interreligious Affairs, called on Catholics and other Christians to unite. "We must not be afraid. We must tighten security," Ulahayanan said. Christian persecution watchdog group Open Doors pointed out in a statement shared with The Christian Post that the attack on the churches comes two days before the start of the Islamic holy month of Ramadan on Tuesday. Over the past several years, there has been an increase of violence against believers around the time of Ramadan. "Ramadan begins in two days and, as westerners, we can hardly imagine a holiday that is accompanied by intense and justifiable fear, but Christians in some predominantly Muslim countries often experience increased persecution during this time," said David Curry, president and CEO of Open Doors USA. "Atrocities like these attacks in Indonesia often increase as groups like ISIS encourage extremists to commit violent acts during this Muslim Holy Month," he added, noting that Indonesia ranks No. 38 on his group's World Watch List.